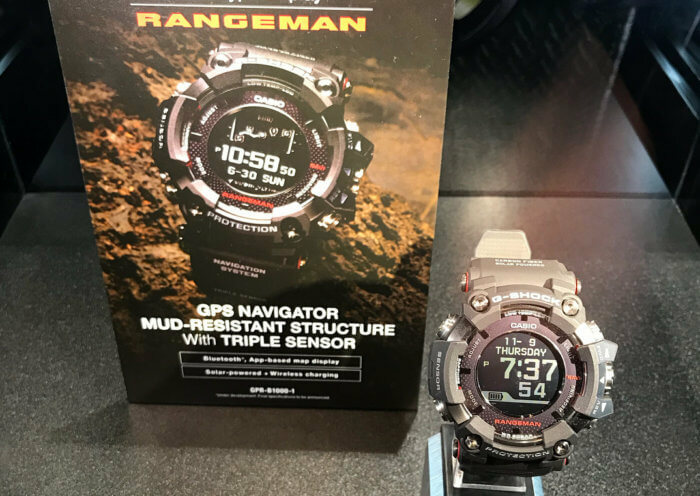 The new G-Shock Rangeman watch was first revealed at the 35th Anniversary event in New York City and will be released in April 2018. The updated edition of the iconic survival series launches with two models, the black GPR-B1000-1 and khaki green GPR-B1000-1B (with U.S. model numbers GPRB1000-1 and GPRB1000-1B). This new Rangeman has a lot to live up to as the original GW-9400 is the most popular Master of G watch and one of the most successful G-Shock models of the 2010s. With its unique GPS navigation features, the new Rangeman GPR-B1000 is equipped to meet expectations. The new Rangeman is the world’s first solar-assisted GPS navigation device and also has a Triple Sensor (alti/barometer, compass, thermometer) and Bluetooth connectivity. The watch has a low-temperature LCD display (-20°C, -4°F), sapphire crystal, and carbon fiber insert band for enhanced durability. It is water-resistant to 200 meters and like the original, it is resistant to mud and dust. The watch is capable of syncing the time through GPS signals, either manually or automatically once a day. While the recent GPW-2000 Gravitymaster has a GPS tracking log (Mission Stamp) function, the GPR-B1000 is the first G-Shock with the Navigation System feature. The watch can display the current location on a route or bearing to a destination in real-time. Tracking data can be saved automatically in intervals and point data (time/date, longitude/latitude, altitude, atmospheric pressure, and temperature) can be recorded with the push of a button. Up to 20 tracks and 60 points can be saved to the memory log. The Backtrack function allows the user navigate to the starting point, using track data to display the route and current bearing. 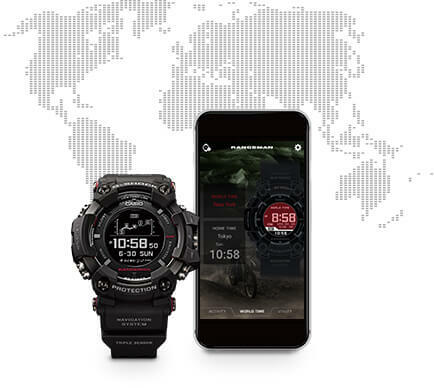 New routes can be created and log data managed on a Bluetooth-connected smartphone with the G-Shock Connected app, with a 2D and 3D map display and timeline for tracking data. Photos taken with the phone while using GPS can be displayed in the timeline view. A connected smartphone also allows the watch to sync with internet time servers, and time-syncing can also be done with GPS signals. 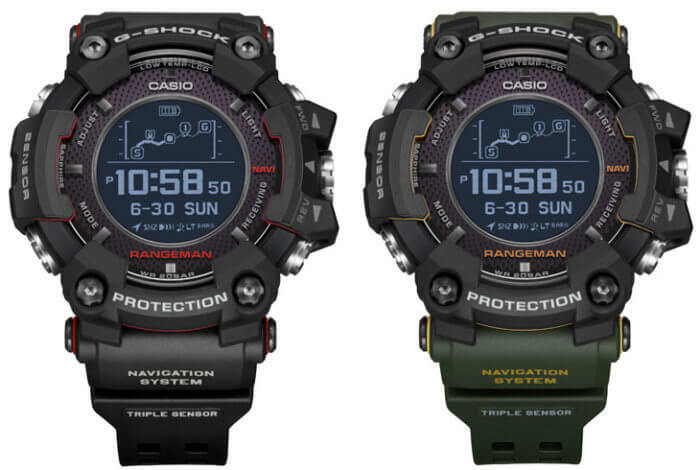 Like the original, the new Rangeman has sunrise and sunset data and now also has a tide graph and moon data. Another new feature is wireless charging with a USB-powered base station. 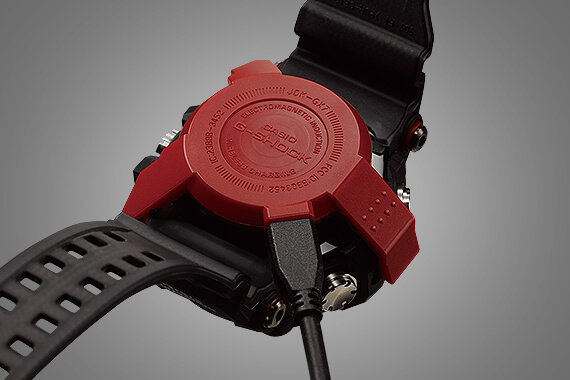 On a full wireless charge of five hours, the watch can use GPS functions for about 33 hours. Four hours of solar charging in bright sunlight (50,000 lux) will provide about one hour of GPS use. A full charge combined with solar power can up the total usage time to 48 hours. Casio says that the solar charging keeps the time display powered at all times, regardless of the status of GPS functions. That sounds like the time display will remain working even if the GPS feature is used past its limit. The exterior case of the new Rangeman strongly resembles the popular analog-digital GWG-1000 Mudmaster but is a little larger at 57.7 mm wide with a full digital LCD display capable of displaying pixels and graphics. This is the first time a pixel display like this comprises the entire display of a G-Shock. A ceramic case back (2 mm thick) allows for wireless charging, enhanced GPS reception, and full shock resistance. 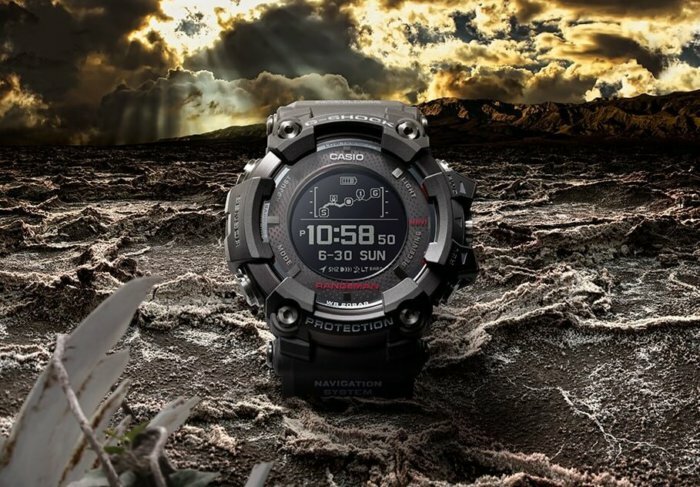 The second-generation Rangeman is an extremely rugged and technologically advanced survival watch and raises the concept of the digital G-Shock to another level. 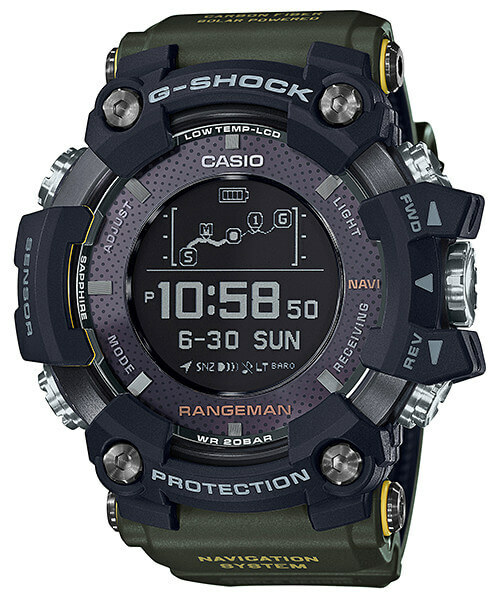 Along with the GPW-2000, the GPR-B1000 ushers in a new era of smart G-Shock watches. See videos of the 2018 Rangeman here and see the official Rangeman page at world.g-shock.com. Black bezel, black bands, and red accents. Black bezel, green bands, and yellow accents. I can’t wait to see one in person. A smart watch with solar charging will definitely be a game changer! Yeah but it can sync the time from GPS signals so that’s not really an issue. A huge step forward in design and functionality compare to the old model. Maybe this will be the fist smart watch i’ll buy. I wonder if this will actually happen? This is it. The watch I’ve always wanted – a rangeman with GPS reception. Not only that but it has solar GPS navigation! I’m so glad they kept all the same basic functions with the long stop watch and long countdown timer, all the while being able to see the time. One thing is missing though… I don’t see a world time on the specifications list. Please say it has it! Yes it does have world time, I forgot to add it. Now I only have one issue left with the watch. Deciding what color I want, haha. Will it be able to use military grid reference to navigate? Is it known what the case is made of including the strap lugs? Metal or resin? The caseback is made of some kind of ceramic to allow the wireless charge, I’m interested in seeing how it is secured to the watch and how thick it is. Does it show notifications for WhatsApp and others ? I dont think so, but i dont understand. If it has mobile Link why not use the possibility? No I don’t think so. That would be a great feature, but maybe there are issues with getting such a feature to work with various apps. 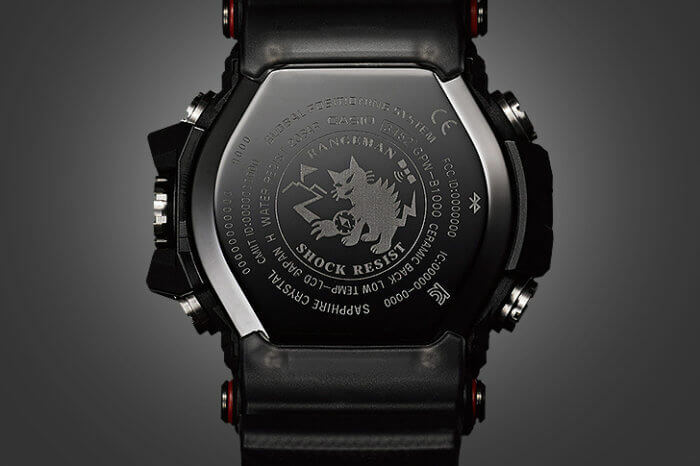 The older Bluetooth G-Shock watches had notifications for Twitter, Facebook, and Weibo messages (as well as call and email alerts), but I’m not sure if those features will still work properly now. It would be nice to see that feature in a new model that is solar-powered. Very good, I’ll probably buy it ! This gshock measures the distance traveled ? How about one push stopwatch shortcut like 9400? Yes this the watch I had been waiting for and by the way does it had ANT? 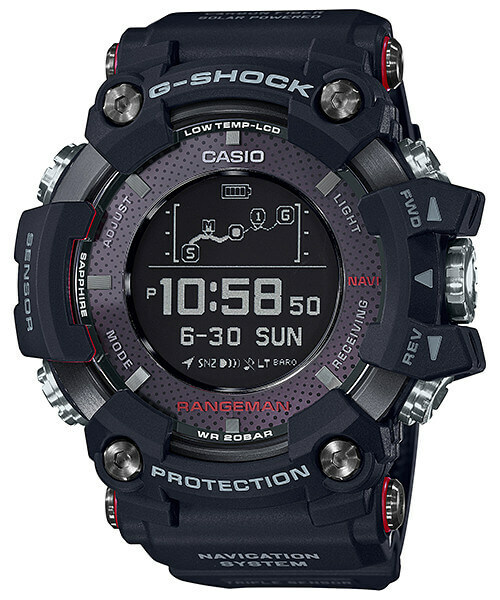 This will be my top of the line G-Shock collection if it fits well in my wrist and of course the wallet! Will the tide times, sunrise/sunset and time adjust based on gps location without syncing to phone? It says the watch Will remain functional even when gps won’t work, does this include compass, barometer etc? How about GPS activity tracking such as running, cycling? Will be supported? Can this watch give latitude and longitude in numbers at certain points. How can I buy one and get it shipped to Saudi Arabia? Also what would the price be in SAR? I recently got this watch and def think its an awesome addition. One thing I noticed though, was that it doesn’t beep on the hour. I’ve gone thru the function and can’t confirm if its missing, but it def doesn’t beep. Any help? Thanks in advance! Hmm it looks like it doesn’t have that feature. Ok, not too big of a deal. I do miss it. Last question is in reference to the Sunrise/sunset. I’ve noticed that mine is off often. It’ll show like 1:00am / 2:50 for sunrise/sunset and I’m not sure how to correct it. Price is bit too high…….but worth it. All I need is a software update with a pedometer and this bad boy is absolutely perfect. I need urgent advice regarding my confusion. I ordered the GPR-B1000 online & recieved it yesterday. The online store gave me the option for a free refund (within a specified number of days). Today I got to know that there is a JDM model, GPR-B1000-1JR available on Amazon. Is there any difference in build quality or the quality of marerials used ? Should I refund the one I have & go for the JDM model instead ? It’s the same. The last two letters just indicate where the watch is meant to be sold. Would there be any software or firmware on this watch? Just got mine, and this watch is missing I want hourly beep function and 1/100 second display on stopwatch mode. It is still a great watch, but I am not sure why Casio have removed these features on the flagship model like this one. Also, the crown feels like it is lagging a bit. I hope there will be a software or firmware update to make this great awesome watch even greater. Many other owners are longing for an update as well. Hi Would it be possible to run with this watch and have the run tracked, including pace, along with the location? Does the GPS have an accurate recording setting for running ? Oh and can we export the GPX/ file of the run afterwards to import into other apps? Thanks in advance. It’s not designed for running and you can’t export GPX files.